i completely and wholeheartedly judge books based on their covers. i am not ashamed of that fact because there are some really ugly covers out there. so when the cover for this was released, i was scared. not going to lie - i was not a fan. but after reading this, i totally get it. it perfectly matches the dark and emotional vibes of this part of the story. theres a lot of darknet and blackweb dealings going on in this book and the cover captures the essence of that really well. i feel bad that i completely and wholeheartedly judge books based on their covers. i am not ashamed of that fact because there are some really ugly covers out there. so when the cover for this was released, i was scared. not going to lie - i was not a fan. but after reading this, i totally get it. it perfectly matches the dark and emotional vibes of this part of the story. theres a lot of darknet and blackweb dealings going on in this book and the cover captures the essence of that really well. i feel bad that i misjudged, but hey, it happens. in regards to the story, this felt really different from warcross. not better, not worse. just different. warcross had a very adventurous and light quality to the story as it built a world around glamorous interactive gaming tournaments. 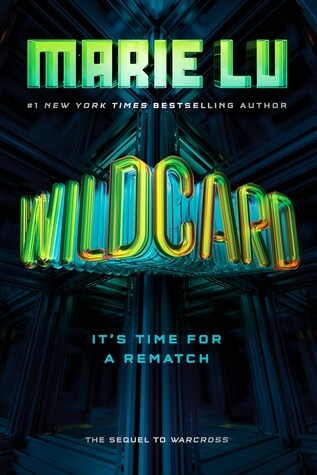 but with wildcard, we saw the very dark side to technology and how it could be used for ill intentions. both are two sides of the same coin - you cant have one without the other. so even though this wasnt quite as carefree as warcross, i thought this was still a really interesting and necessary story. i thought hideos character development coming full circle was really fulfilling and satisfying to read. a little sad, but i feel very content with the way things ended. and on the note of endings, apparently this is only a duology?! marie lu is the queen of trilogies, so i feel somewhat cheated out of a book. i am not okay with this. lol. I went into this one without a refresher on Warcross, but found that I didn’t quite need it. It was easy to slip back into this series and I was eager to settle in and see what happened...but I wasn’t even close to being ready. Emika is still an awesome MC. She’s strong and loyal and I loved how she is compelled to do the right thing, no matter how dangerous. Of course there are some of the same characters from Warcross, but I won’t mention anything there. Plot wise, I didn’t know what to expect a I went into this one without a refresher on Warcross, but found that I didn’t quite need it. It was easy to slip back into this series and I was eager to settle in and see what happened...but I wasn’t even close to being ready. Plot wise, I didn’t know what to expect and I was blown away. It’s a slow delicious peel back of reveals and I was captivated the entire time. Yes, I’m being vague on purpose because spoilers. Overall, this series has been intriguing from the start and this ending was everything I could have wanted and a few things I didn’t know I needed. I was SO nervous going into this, but Marie Lu did not disappoint. The story picks up shortly after where Warcross left off - and to be completely honest, if it's been a while since you've read Warcross, I'd recommend either rereading or refreshing yourself on the characters. I didn't, and I kept forgetting who was who in terms of the Pheonix Riders/etc (I know, I'm terrible). With that said, I had a * little * bit of a struggle in the first 20-ish percent - it wasn't that the pacing was slow, I I was SO nervous going into this, but Marie Lu did not disappoint. The story picks up shortly after where Warcross left off - and to be completely honest, if it's been a while since you've read Warcross, I'd recommend either rereading or refreshing yourself on the characters. I didn't, and I kept forgetting who was who in terms of the Pheonix Riders/etc (I know, I'm terrible). With that said, I had a * little * bit of a struggle in the first 20-ish percent - it wasn't that the pacing was slow, I think my brain was just trying to catch up. Obviously, spoilers for book one, so read the below at your own risk! With the algorithm in place, and Hideo basically controlling everyone (why is this so appealing? lol) - Emika knows she needs to do SOMETHING, and Zero is trying to convince her to work alongside him to stop his brother. But there lies a bigger problem: Emika suuuuper does not trust Zero. Only... it turns out... someone tries to kill her, so Zero to the rescue - wahoo! And then the plot takes off, and things get nuts, and the last half - let me tell you - is non stop action. Like, hello, I am still gasping for air. But I can't say much more without revealing important plot details that I think should be a surprise - and I assure you, the surprises are MANY. Marie Lu can write some damn twists. Instead, I'll just hint at some tidbits that I know everyone is DYING to know about - without giving anything away. 1. Do Hideo and Emika get screentime together (because let's face it, most of us still shipped them after book two)? Oh yeah. Ohhhh yeah. Yep. Yes. Their moments miiiight have been the best part of the book. 2. Do we get more information on Zero? Chyeah we do. Oh my gosh. THIS. I can't. I can't. My heartstrings - I think Marie stole them. As an author, she's always been SO strong at character depth and emotion, and she doesn't disappoint here. Zero and his story heighten the plot to a new level, and what you'll learn is a game changer. And no, I doubt you'll be able to guess any of it. Heck yes. Though, again, this is where a refresher from book one would help, because I couldn't help but feel a bit lost at times. I couldn't remember how they worked. Either way, they were fun though! All in all, this was a fantastic end to Emika's story. I was SUPER worried because I thought there was no way this could end in a way that was satisfying. And while I can't say much about the end, I'll say I think Marie Lu did it justice - spinning it in ways I couldn't have predicted. I mean, my heart is punctured a little, but that's to be expected (and no, not in the way you think). Lastly, I have to comment on the writing, because ahhhh HOW IS SHE SO GOOD. Also, If you haven't picked up Marie's other series, Legend, you're missing out! WE HAVE A TITLE! I love it! so is no one talking about the fact that THIS HAS A TITLE NOW!!!!!! and a release date!!!! September 18, baby!!!!! i don't think you have any idea how much it actually pains me to look at my own rating. it breaks my little heart into a million tiny pieces. i read warcross back in january, and it became an instant favorite. i remember it being so addictive, so easy to read. it was the thing that my inner nerd desired. and it was what she deserved. and now i can't even correlate warcross with wildcard, like someone tell me why these books seem to take place in two entirely disparate universes?? the core, the whole idea of warcross, to me, was brilliant. it was exciting and thrilling and absolutely terrifying: virtual reality advancing even farther than we can imagine in this day and age. marie lu created something that i loved. the warcross matches were the first thing that i could compare to quidditch in terms of "oh my god i love this i want to be a part of this please give me 398 pages of only this". and that was where i went wrong. apparently. because marie lu had a completely different idea for the series. the original idea of warcross slowly perished under whatever it is that wildcard was trying to be. she felt the need to turn it into something that i couldn't identify anymore. and this is where i have to put my !!!!!!!!! SPOILER WARNING !!!!!!!!! • please all i want is one goddamn game of warcross.... isn't that what i signed up for? • HE MIND CONTROLLED THE WHOLE ENTIRE WORLD??? and when confronted with that he was legit like "y'all hear sum?" and that's that on that, folks. the sad thing? i actually really liked the first half of the book. and i was so ready to love this book with all of my shriveled up tired soul. wildcard ruined warcross for me. and that's the tea for today! thanks for tuning in. this is the worst book i've read in recent memory. do you ever do something and as you're doing it you're like "why am i doing this, this is a bad choice, why am i like this?" Marie Lu - Note: Many apologies, but I'm woefully bad at checking my Goodreads emails! If you'd like to send a note/msg, please catch me on Twitter: http://twitter.com/Marie_Lu . Thanks!